Go to Alpemix.com and download Alpemix.exe program to your computer and initiate with double click. When program is initiated, ID and password is shown on the screen. 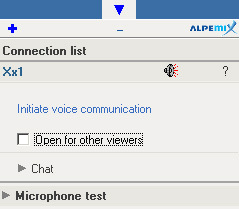 Alpemix.exe is also downloaded and initiated at the computer to be connected to. The other person gives you the ID and password shown on the screen of the computer to be connected. Write these two numbers on the screen and “Connect”, peer-to-peer connection is ready. Which settings are required for connection? In order to use the program, you don’t need to make any settings in your computer or system. You can download and use the program. Which operating systems are suitable? Is it enough to delete the program for uninstalling? Program consists of an exe file and Works without installation. Don’t requires another file such as exe, dll, etc. This program is uninstalled when Alpemix.exe is deleted from your computer. Is it possible to re-connect to my computer without my permission? You must give 9 digits ID and 5 digits password to opposite person for connection to your computer This ID and password change at every time you initiate the program. When you close and restart the program, the person previously connected to your computer can not reconnect without your permission. Alpemix.exe does not work in background. All communication are encoded in high security level. RSA is used for key transmissions. AES (256bit) is used for encoding instant messages. RSA used in key transmissions and AES in instant messaging are accepted as completely safe according to existing standards. Is peer to peer connection established with the other computer? 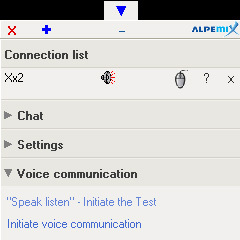 Alpemix software attempts to establish peer-to-peer connection with the other computer; and succeeds establishing peer-to-peer connection at very high rates. But, rarely it maintains the communication through main servers when peer-to-peer connection is not established. You can view the type of the connection between you and the other person easily from “Connection Type” menu. An option reveals at every time I start the program in some windows versions. In Vista operating systems, when the program is initiated “Continue – Cancel” option reveals. Even “Cancel” is selected, program continues working. But if the program is started by selecting “cancel”, the person connected to your computer can’t access some screens. Access is impossible to Vista’s permission requiring “user account supervision” screens, logo screen, etc. Can I initiate the program from a CD or USB? Due to not requiring installation, it can be initiated directly from CD or USB. Some antivirus programs are giving warning for Alpemix! It can be used timeless without any charge. For extra features, paid user right must be purchased. What are the passwords only valid for presentations? If you give your “only valid for presentation” password with the ID on the screen to the other side, the other side can connect for presentation even he/she selects the maintaining option. How can I connect to my home computer? 1. 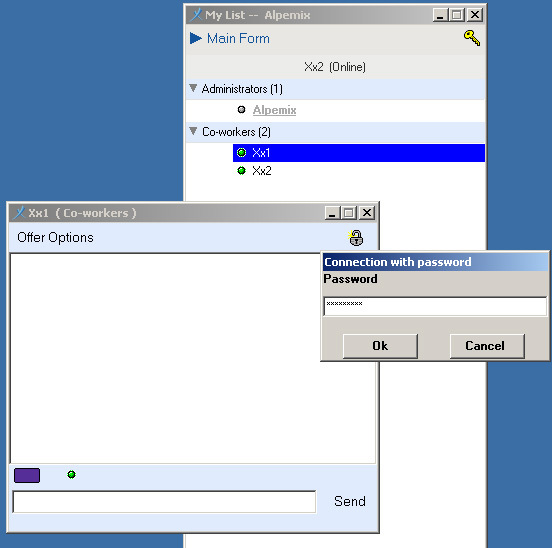 With ID and Password: Start the Alpemix in your home computer. Write the ID and password appeared on the screen. 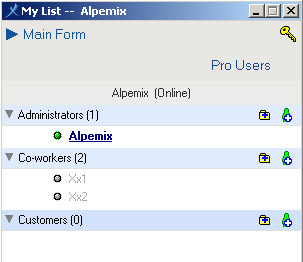 Then start Alpemix program in any computer, enter this ID and password and now, you can connect to your home computer. 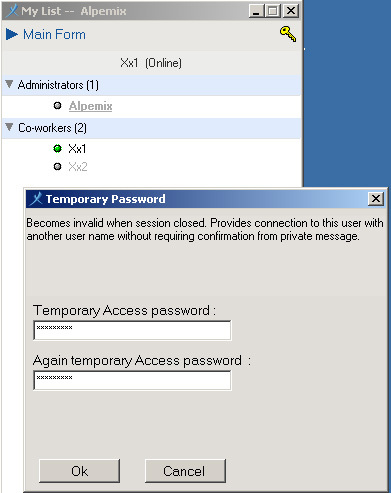 Log in with Xx2 user name from another computer and see Xx1 online in our list (Diagram 3). Double click on Xx1 and open the private message screen. Click on the key icon on the right top part of this window and write the temporary password defined from the form and press enter. Now, connection to home computer is established (Diagram 4). How can I define my customers, work mates with the list feature? How can I add another registered used in my list? You can’t add another member registered in the system in your list. Each company or user defines its own users and only communicates with those users. How a question is added while watching presentation? How the audio communication is established? A small window reveals in descending order on the right bottom part of both the connected and the connecting persons (Diagram 1 and 2). Speech of the side clicking on “Start Audio Communication” option starts sending to the other side. If both sides select this option, they can talk mutually at the same time. If more than one persons are connected to a computer making presentation, if I select the “Start Audio Communication” option, my voice is sent to only the presenting person. If I select “open for others” option, my voice is both send to persons who are making and watching presentation. I can’t use audio communication option. In order not to have problems, you must have audio card in your computer and mount it correctly to the operating system. Out of this GSM 6.10 codec must be installed in your computer. This codec is installed in almost every computer. I want the establishment of a communication only among the computers within the company. How can the access to the unattended computers be achieved? What is a Group Password? Can Alpemix be used on the computers which do not have internet connection in the company? What different types of support can I provide for my customers with Alpemix? How my customers can get support from my authorized operators by just typing their name and surname? In Which cases I can not access some screens? What is Alpemix Service Application? How can I deploy service application to all computers with Group Policy? How to connect multiple different companies to a service?